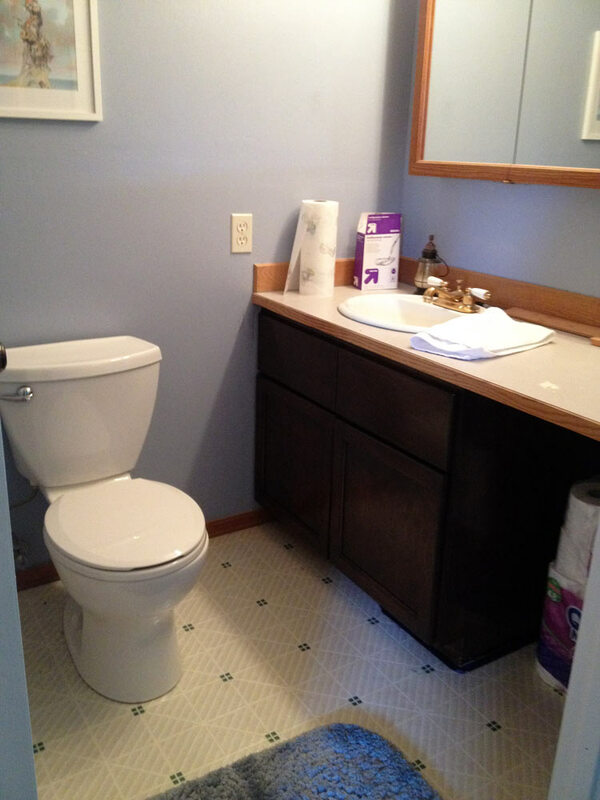 This post is part of a multi-post series showing off the DIY renovation of our office (“guest”) bathroom. 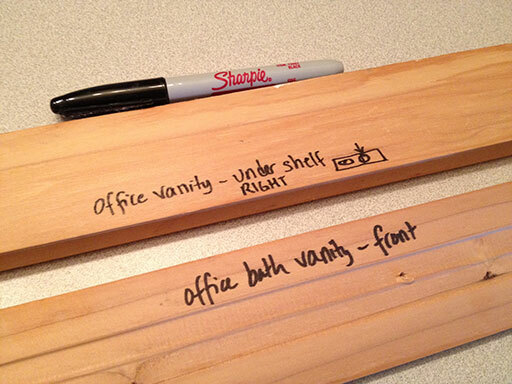 Here’s how I updated a small, dated bathroom vanity for well under a hundred bucks. This is my very first staining project (though I’ve got plenty of experience with painting wood) so I followed the same steps demonstrated by Jessie over at Imperfectly Polished. I think it turned out pretty good. 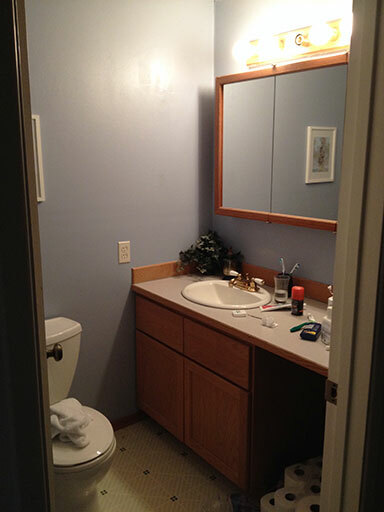 Here’s our office bathroom’s “Before”, looking pretty much like it has since we moved in 3 years ago. Take it all in: the brass faucet has resisted all attempts to fix its leak, the sink lacquer is chipping, the light fixture is straight out of a 1970’s Hollywood dressing room, and the vinyl floor is from a 1980’s hair salon. 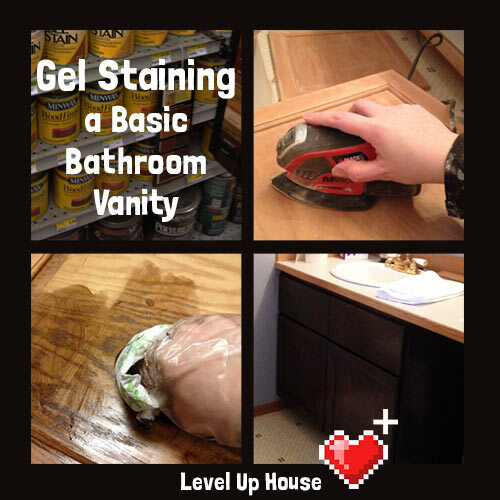 Like most of our DIY projects here at Level Up House, this bathroom will evolve over time, starting with the very first step: staining the vanity. This is not our prettiest bathroom. 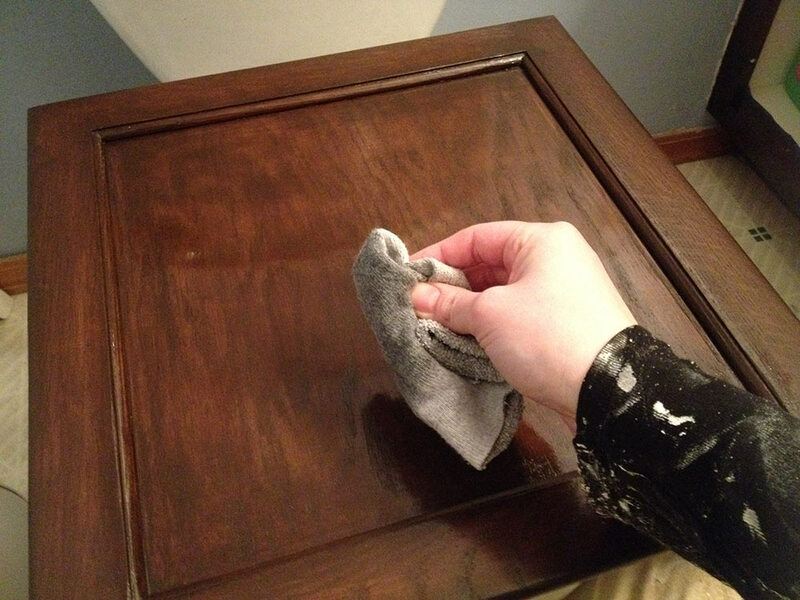 I was originally going to buy the smaller size can of stain, but went with the 16oz after realizing it was going to take several coats (and indeed, it took 5 complete coats) to get my vanity’s wood as dark as I wanted. The cheesecloth was recommended to me by the “staining professional” at my local hardware store, but I think it was kind of silly. Any old rag made of thin cloth would have worked fine and would have saved me $7. My local Home Depot doesn’t carry Minwax or much variety in gel stains. I had to hit up McLendon Hardware instead, where I found Minwax and an overwhelming selection of colors to choose from. 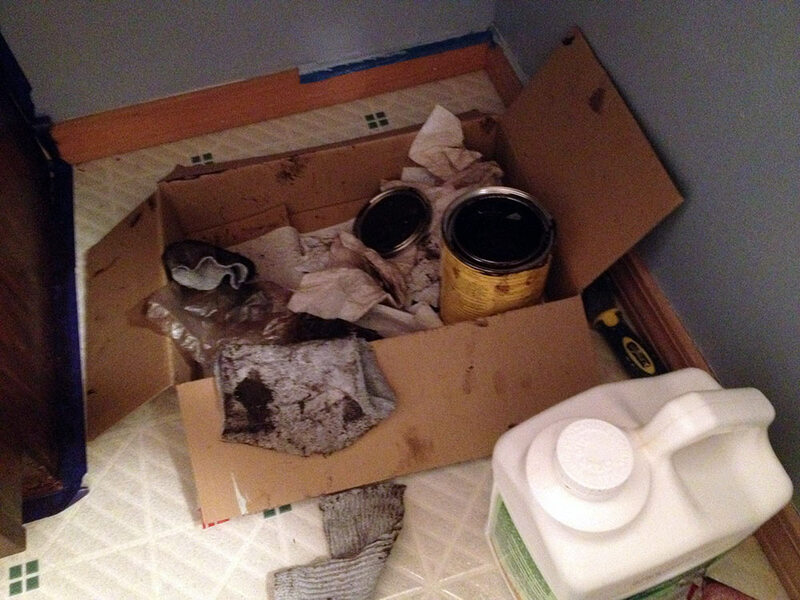 Countertop cleared – bathroom is ready to begin its transformation into a work zone. 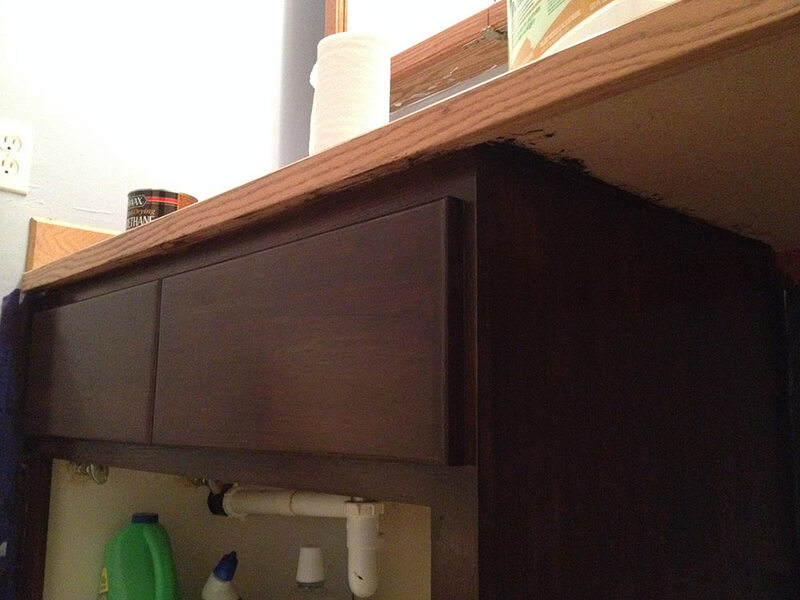 Any wood trims around the base of the vanity should come off, too. Oh, and label each one with its location. Labeling your trim pieces is the best thing you can do for yourself. Don’t ask me how I know this. 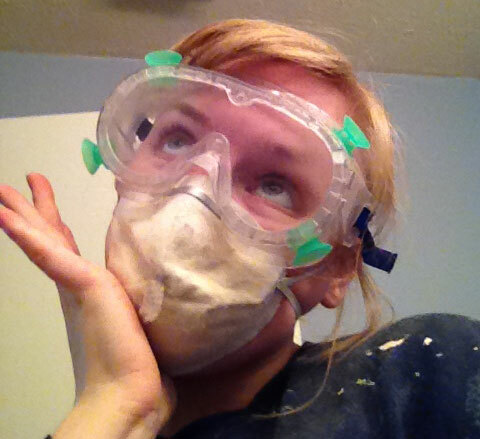 Okay, the first real step here is to put on the goggles, dust mask, and ear plugs. Sanding kicks up a ton of dust and it all goes straight into your eyeballs and lungs if you don’t properly gear up first. 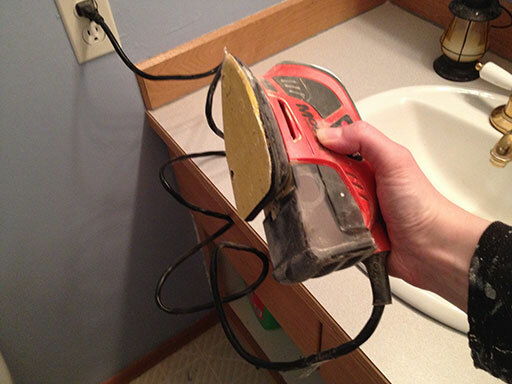 My corner sander is equipped with 100 grit sandpaper. It took about an hour to sand off the thin layer of clear shininess that currently covers the vanity. Fortunately, the existing varnish (or whatever it was) wasn’t too thick and sanded right off. Corner sanders are great for small projects and tight corners, but if I do another wood staining project I’m going to invest in a circular sander to speed up this process. Go ’round in circles and get all that shiny layer off. Be sure to get the corners and edges, too. 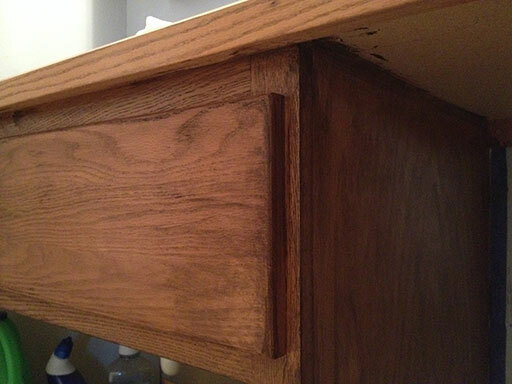 For that narrow area above the faux drawers I rubbed a small roll of sandpaper left/right. 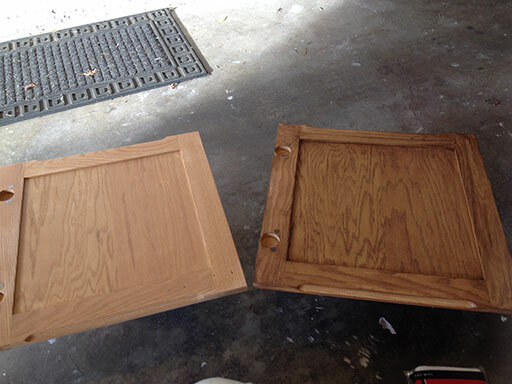 The doors were detached and sanded separately (I sat on the floor and sanded them in my lap). When you’re done sanding vacuum the area clean with a shop vac and the brush attachment. Consider wiping everything down with a wet rag, too. Getting all the dust out of the room is just a good practice – you don’t want the debris getting mixed into your stain. 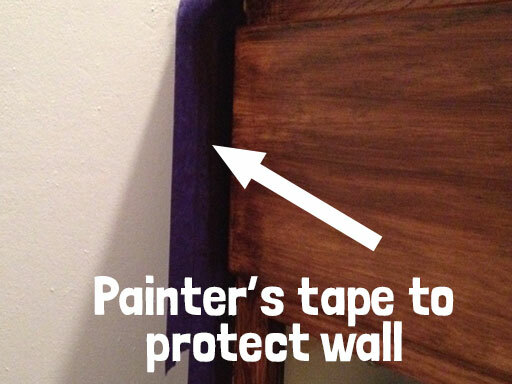 If your vanity touches walls or floors that you care about, a few strips of painter’s tape will protect those things. 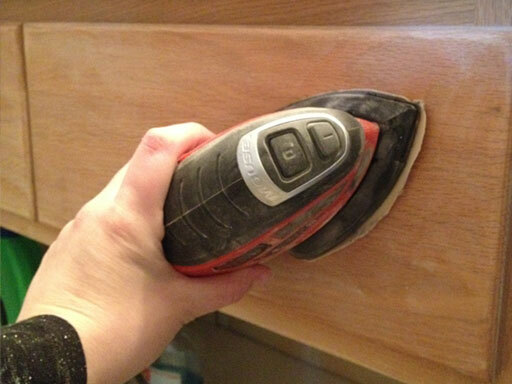 Wipe off any remaining sanding dust before sticking tape to the surrounding walls, interior, and floor. I didn’t do a side-by-side to test if this “pre-stain wood conditioner” stuff actually makes a difference, but at $7 a can I figured I’d get it since it was recommended by the how-to guides I consulted before starting this project. 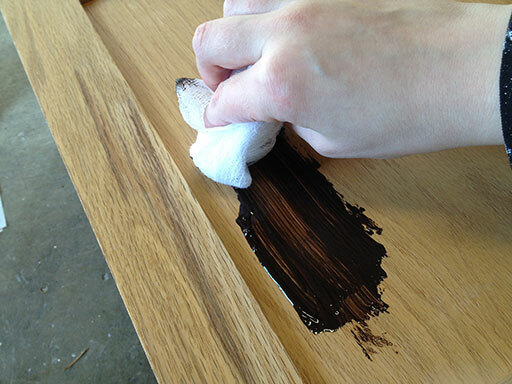 Using it is straightforward: open the can, dip a paper towel in, and smear it all over the wood you’ll be staining. You’re supposed to apply stain within 2 hours of applying the pre-stain, so don’t do this step and then go to bed or something. 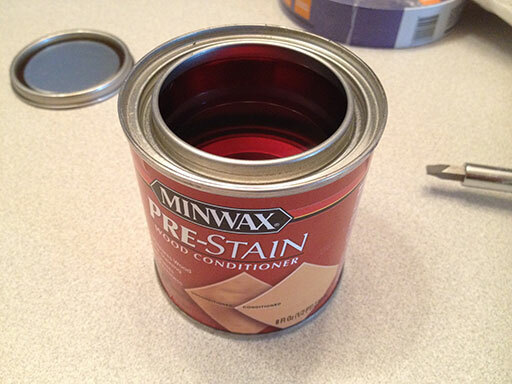 This is the only time where “pre-staining” is a good thing. Gel stain is disgustingly thick and gelatinous, but it has to be stirred into a smoother consistency before it can be applied. I poured half the can’s contents into another container to make it easier to stir in both containers. 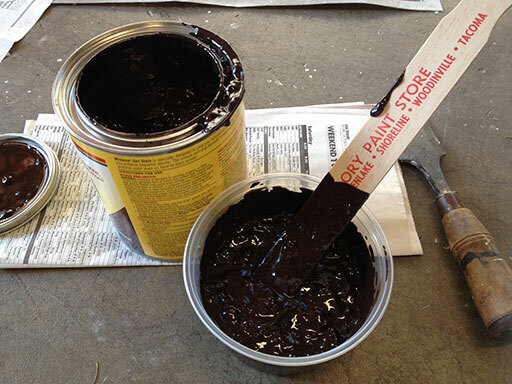 A good old paint stick was plenty strong for cutting and stirring this goopy stuff. Gel stain is goopypoopy. Many, many comparisons to other substances were made. Are we staining yet? Yes, yes we are. 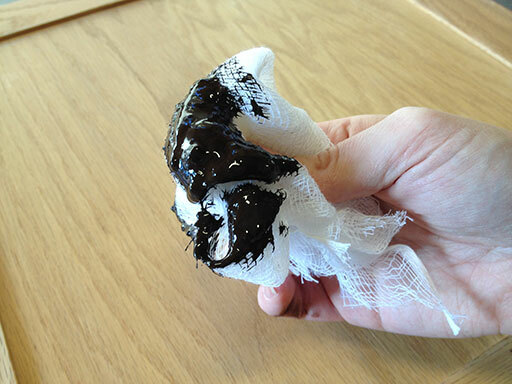 Dip the cheesecloth or rag into the gel stain – get a small amount, no need to go nuts here because most of it’s going to get wiped back off anyway. Oh, and wear gloves. This was taken 30 seconds before my hands became chocolate colored. Go ’round and ’round in circles, then wipe in the direction of the grain. Gel stain application technique: put it on heavy, smear it around around in circles and then wipe in the direction of the grain. Don’t let it pool too much in the corners and crevices. Before and after: bare vanity door on the left, one coat of Minwax gel stain in “Walnut” on the right. They look like chocolate squares. I wish they were chocolate squares. And that’s just the first coat. Now it needs 8 hours to dry, so I clean up for the day and take a shower. Most of the clean up is me removing gel stain from my fingers and hands, but that was easy with a little dab of mineral spirits. 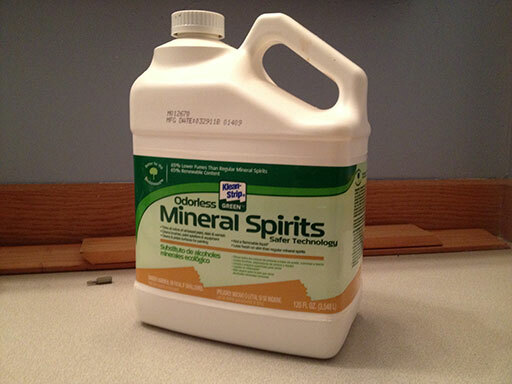 Mineral spirits nuke gel stain right off your flesh and doesn’t leave you dry or itching. At this point, it’s apparent that I’m going to need several coats to reach the level of darkness I desire. It’s also apparent that my wood is resisting the stain more than my paint stick, which turned into 98% dark chocolate in just one coating. I’m no wood expert – in fact, this is the first thing I’ve ever stained, so at this point it’s good to keep realistic expectations. I’m okay with wood grain showing, with a bit of unevenness (isn’t “shabby chic” in style anyway? ugh, that phrase…). Second stain coat went on just like the first: rub it in, wipe it off. I have to admit to being a little frustrated at this step: the second coat doesn’t look much darker than the first. Wtf? Each coat makes a minimal difference, at best. Uh, yeah, my experience was more like needing 6 coats total. 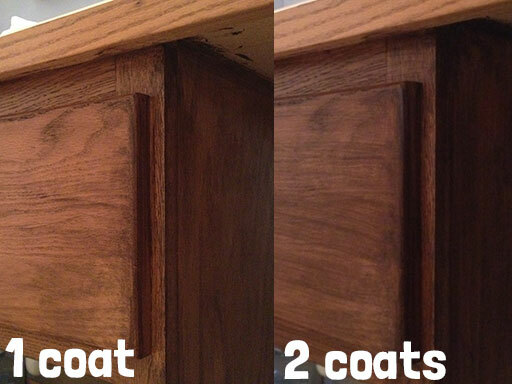 I also had to wait 24 hours between coats, or else the previous stain started smearing around and wouldn’t “stick”. This project stretched out, ultimately taking me just over two weeks to complete it. Partly to blame was my own ennui and dwindling enthusiasm for the project as each coat hardly looked different than the previous. (Each coat DID make a difference, it was just a barely perceptible difference). It’s chocolate. Oh my god. 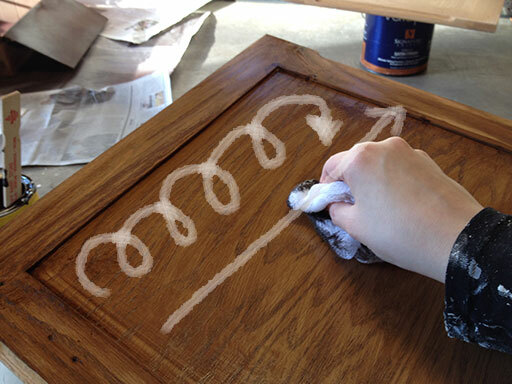 Polyurethane is just a protective clear coat that goes on over your dried stain job. I waited a full week between my last coat of stain and my first coat of polyurethane, and 24 hours between each coat of polyurethane. You can probably wait less time if you’re in a big hurry, but I wasn’t (and my Dad was in town). 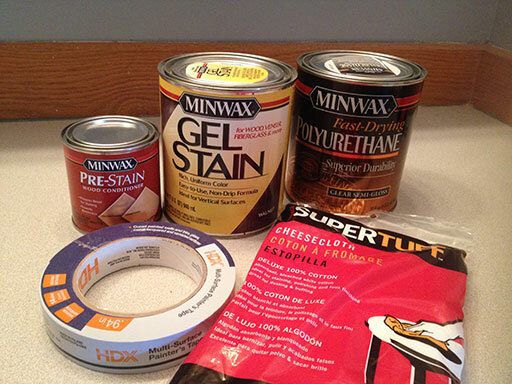 Compared to all those stain coats, the polyurethane step is easy. Just blot it on, wipe it off. I used an old sock foot as my “paintbrush”, because I hate buying brand new brushes for this kind of stuff. My sock worked fine. Be very careful putting your hardware back on! Your stain and polyurethane coats should be really durable, but it’s easy to scratch things when drills and metal hardware are involved. 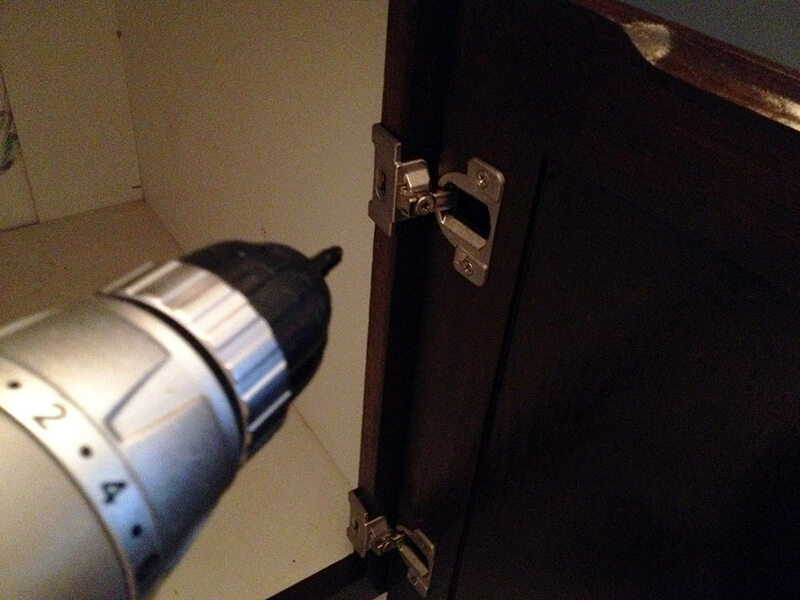 Reattaching the cabinet hardware is easy as long as you kept track of the pieces (you put them safely in a ziplock bag, I know you did). Here it is: the newly stained bathroom vanity. It’s just a humble builder cabinet, so it made for a great First Stain Project Ever. Obviously, there are still a lot of things I would like to update in this room. The sink faucet leaks, the sink is rusting, and the countertop is scruffy/stained, and a tiled ceramic floor would add a lot of appeal. But I had to finish the vanity first to be sure it was worth putting a new countertop onto (vs. replacing the vanity as well). In the spirit of not spending a fortune on this bathroom, I think I’ll be keeping the stained vanity and finding a nice granite remnant to replace the old countertop, along with an undermount sink and new faucet. Cheesecloth was not necessary and too messy. Everyone’s so excited about cheesecloth but I really hated working with it. It was flimsy and I was going through way too much of it. At $6 a bag, I felt pretty silly wasting perfectly clean and brand new cloth when I had a bin of torn socks upstairs. I switched to paper towels (for staining) and socks (for polyurethane and the last coat of stain) and everything went fine. Carry everything in a box. 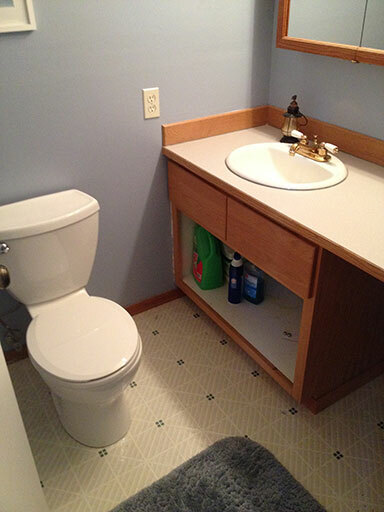 Since my bathroom is pretty small, I basically had two workstations: the garage floor (for the vanity doors) and the bathroom itself (the rest of the vanity). Carrying all my supplies in a cardboard box made it easier to move from one workstation to another. Staining is messy. A box can help. Wear a mitt. Staining is brutally messy and gets into your skin very quickly. 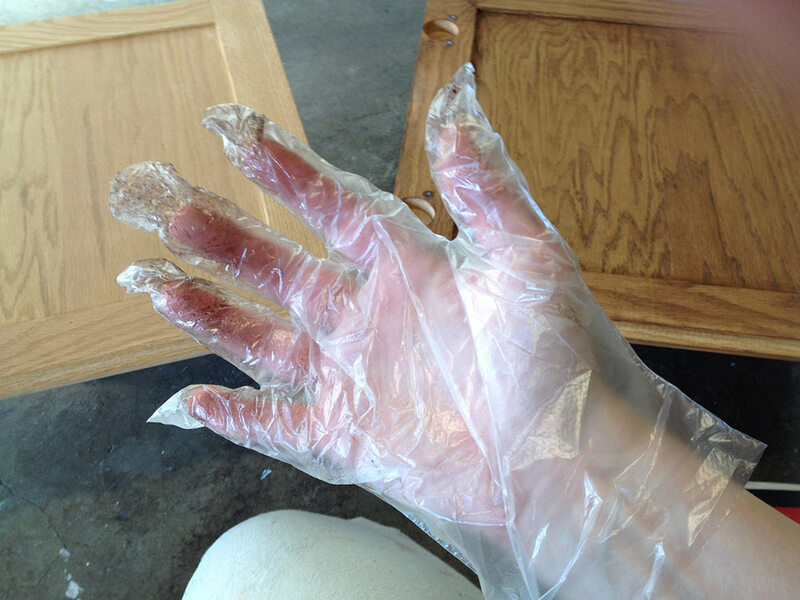 I never liked wearing gloves on previous projects, but they were an absolute necessity for this staining project. Cheap plastic mitts from the dollar store for the win. Mineral spirits are essential. If you don’t know about awesome mineral spirits are, I’m here to tell you: they are awesome. Wiping my fingers and tools down with mineral spirits made cleanup extremely easy and fast. Stain does not come off with soap and water! General gel stain, one coat two max and zero sanding. I did the exact project you did with same products and trust me there is a better way. I have a similar old bathroom vanity that I want to stain. Is it necessary to strip it all the way down or can you sand it just to make it a little rough? I’m told that cheap wood won’t soak up the stain unless it’s stripped. Your thoughts? For all future stain projects I highly recommend using a foam brush for application, don’t use cheesecloth, tack cloth, paper towels, rags, socks or any other wipe-on method otherwise it’ll take you six applications to get the stain color you want. If you had used a foam brush you wouldn’t have needed more than 2 or 3 coats, tops.